In the late Middle Ages, trade flourished in Europe. 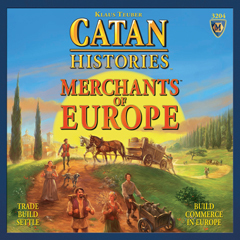 Economic groups like the Hanseatic League, the Welser and Fugger families, and merchants from Northern Italy established trading posts and factories in all of the important cities throughout Europe. These businesses provided the population with goods of all kinds, such as fur from the north, cloth from Flanders, wine from the south, and spices from India. The most important commodity of all was salt. In the Middle Ages salt was highly prized it was used to preserve food. You are a powerful merchant! Start your trading posts in three cities. Recruit new merchants and send them to distant cities to establish trading posts and expand your interests. The more trading posts you have, the more commodities are at your disposal which you can sell profitably in foreign cities. To ensure that your commodities arrive safely at their destination, you must open up trade routes and equip caravans. You win the game if you are the first to deliver all of your commodities to foreign cities.